Lawrence Fisher was the most flamboyant of the seven very prosperous Fisher Brothers. Along with his father and brothers, he earned his fortune in the Fisher Brothers Body firm that supplied General Motors. In the mid-1920s, Lawrence Fisher decided to build a magnificent home for himselfone that would clearly indicate his wealth, perhaps more than his good taste. He selected this isolated corner of Detroit apparently because of his desirable location near Lake St. Clair. From 1925 to 1934, Fisher was not only a principal in Fisher Body but was also president of Cadillac. C. Howard Crane, the great theater architect of that age, was selected to design the house. He was known for his exhauberant style as illustrated in his Detroit masterpiece—the Fisher Theater. This was apparently meant to be a huge Mediterranean-style villa similar to some that rich individuals were building in Florida at this time. Fisher was a close friend of William Randolph Hearst who was building his San Simeon estate in California at this time so some think that Fisher wanted a Detroit home to rival San Simeon. This is a 22,000 square foot home situation on four acres of gardens. However, it has only two bedrooms. The interior floors are rosewood parquet. There is black walnut paneling with numerous marble columns and several walls covered in hand-painted leather. At one point, 200 craftsmen were employed to build this house, many of them apparently brought from Europe for this purpose. The master bathroom is done in lapis blue Pewabic tile. Seventy-five ounces of gold and 140 ounces of silver were used for the interior trim. No one cultural style was used in the interior. Rather, the style varies from room to room. Shortly after moving in, Lawrence Fisher and his close neighbor Gar Wood, who lived in a nearby mansion, had a canal dug so that their homes could be directly linked to the Detroit River and Lake St. Clair. Fisher then build a boathouse so that he could have indoor parking for his 104-foot yacht. Apparently, he could go from his living quarters to his yacht without going outside. The four acres of gardensstill maintainedinclude three fountains, a waterfall and peacocks. There are many stories about Lawrence Fisher. Apparently, he had many rich Detroit friends who preferred Packards to Cadillacs. He convinced some of them to take the Packard bodies off their cars and replace them with bodies he had specially built for their Packard chassis. There are also stories that, when he was going out, he would call the Cadillac plant on Clark Street and ask that a car matching his attire be provided. Finally, there are stories that because of romantic interests, Jean Harlow spent much time at this house on Lenox. Alfred Brush Ford, the great grandson of, purchased this home in 1975. He and his wife subsequently donated it the Hare Krishna movement. They maintain it as a cultural center that is regularly open to the public. 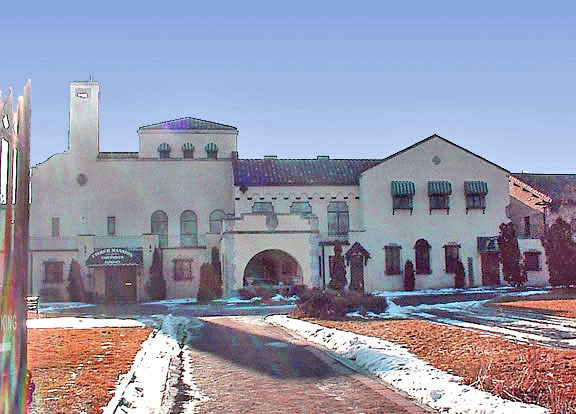 Use at Present: The Bhaktivedanta Cultural Center of the Hare Krishna group. Historic sites. This building is presently listed on no historic registries.